For breakfast this morning, my husband decided to create a new way of eating oatmeal and it was great! Can you really have a “banana split” for breakfast? Sure you can, especially when all the ingredients are healthy and vegan! If you ever wanted to jazz up your breakfast or if you struggle with kids who don’t want or like oatmeal, this recipe will be a big help in making it FUN. All ingredients are healthy so you don’t have to worry about adding refined sugars or even chocolate with this fiber packed breakfast! 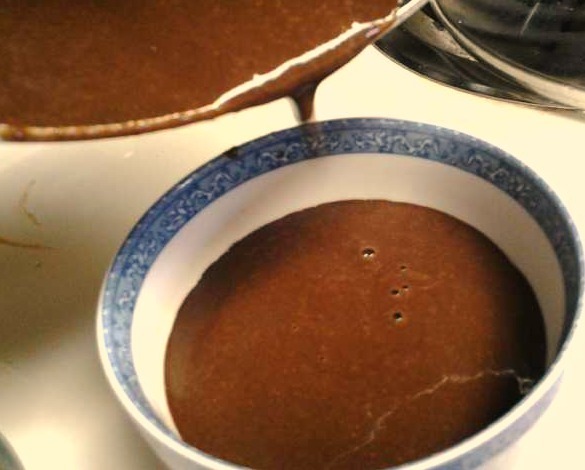 Carob has no caffeine and has more nutrients than those sugar filled chocolate syrups kids are so attracted to. Best of all, with this fig and date carob sauce they won’t even know the difference! The more nutrients we put on our kids’ plate, the more behaved our kids will be and who couldn’t use that?! I love this carob sauce! It basically just figs, dates, carob powder, almond milk, and vanilla! Place the dates, figs, almond milk, and carob powder in a high powered blender and blend until smooth. Filter the sauce from the blender into a small saucepan to prevent any pieces of figs and dates from getting through. This step will also help make this recipe a kid-friendly one! Next, stir in the honey and vanilla and bring the sauce to medium heat for just a few minutes. Don’t overheat or overcook the sauce. Remove from heat after 3 minutes. Bring the water to boil with the pinch of salt. 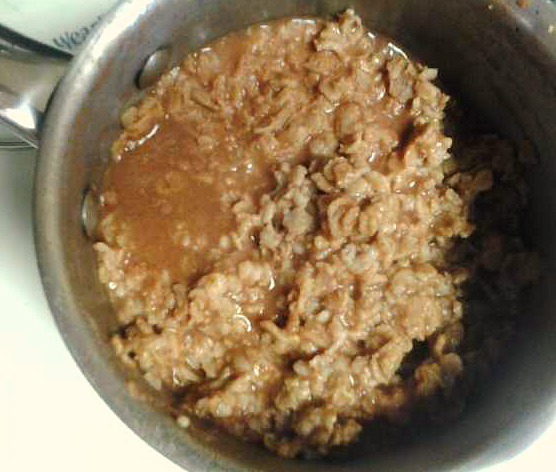 Add the rolled oats and stir for one minute. After 3-5 minutes, remove from heat and add in the spices. Cover the oatmeal until the water is absorbed. To make an oatmeal banana split, simply serve the freshly made oatmeal into a bowl. Split a banana and place it along side into the bowl. Then pour some figgy carob sauce on top and sprinkle dried organic shredded coconut on top. You can also top with fresh fruit and nuts such as strawberries and walnuts to really give it that “banana split” flavor! 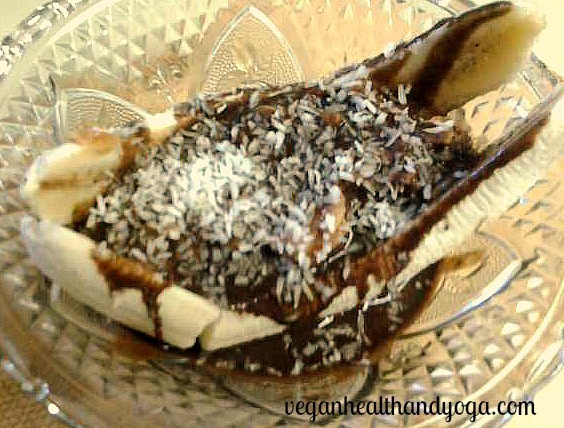 This entry was posted in Carob Recipes, Oatmeal and tagged bananas, breakfast, carob sauce, kids, oatmeal. Bookmark the permalink.